Mbeku the tortoise is proud of his magnificent, shiny shell — maybe too proud. Because he is so handsome, the greedy tortoise feels he can demand the biggest share of everything, especially food. When the birds are invited to a feast in Skyland, Mbeku is determined to go with them. But tortoises, even clever ones, cannot fly. Mbeku convinces the birds to help him and soon he has magnificent wings of his own. When Mbeku repays the birds with treachery, helearns he is not the only one who can play tricks. 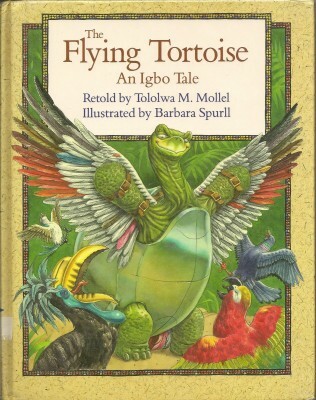 Tololwa Mollel re tells with verve this spirited traditional tale of the Igbo people of Nigeria, bringing the crafty tortoise’s schemes to a satisfying and lighthearted comeuppance. The Flying Tortoise has been translated into Korean. Mollel has adapted the story into a play in a production that the critic Liz Nichols of The Edmonton Journal described as “irresistible.” To see details of Mollel’’s play adaptation, see The Flying Tortoise – the Play. Long, long ago, Mbeku the tortoise had a magnificent shell. It was so smooth and clear and shiny, it even glowed in the dark. And because Mbeku was so handsome, he thought he deserved the lion’s share of everything, especially food. Mbeku had a bottomless hole for a stomach and would stop at nothing to fill it. The combination of a lively narrative and vibrant illustrations result in a vivacious read-aloud choice. Energetically paced… [i]ts language… concrete and immediate.